Well, maybe…but that’s not what we’re here to teach you today. We’re going to tell (in words) then show (with video) you how to teach your dog “Go To Your Bed” and today “Your Bed” refers to the Carlson Portable Dog Cot. Yep, the same one Charlie helped us review a few months back. 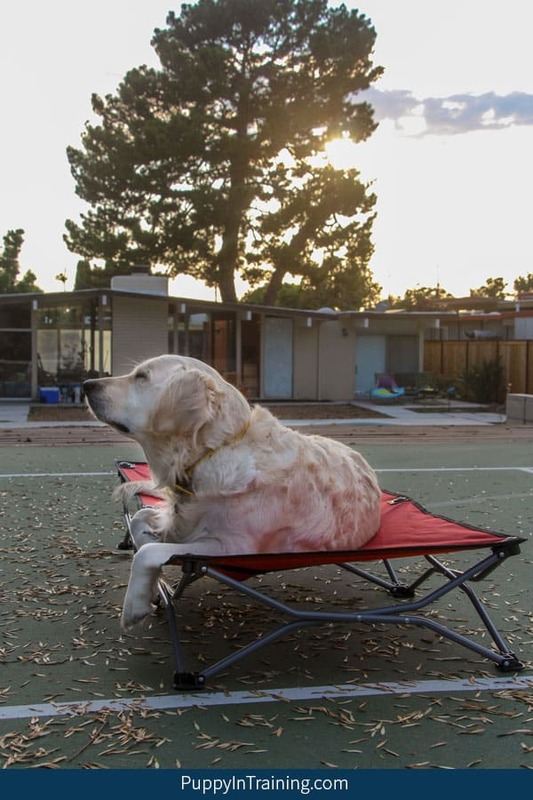 The Carlson Portable Dog Cot also known as the Carlson Portable Pup Pet Bed is a very cool, easily transportable, elevated dog bed. We’re not adventure dogs, but we do see all the possibilities available for the outdoor doggy who likes to backpack, hike, and camp. We haven’t been camping with the dogs in years and probably won’t in the foreseeable future since we have twins (human, not doggy) due any day now, but I can foresee us using our Carlson Portable Dog Cot when we go to the park with our fellow guide dog puppy raisers. So, what are our plans for our Carlson Portable Dog Cot? We want to use our new dog cot to help redirect some of our Raven’s unwanted behaviors and we’ll do that by teaching the cue: “Go To Your Bed”. 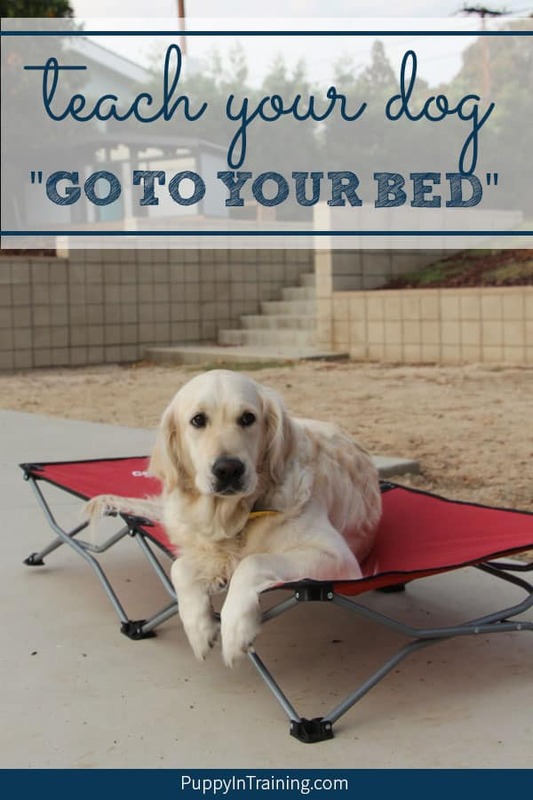 Why Teach Your Dog “Go To Your Bed”? While there are many reasons to teach your dog a cue like “Go To Your Bed” I have a top 3 I plan on using with my dog, Raven. Raven has a habit of barking at the front door when she hears or see’s people, hears the doorbell, or see’s a ga-ga-ga-ghost! Not really a ghost we just sometimes think she hears or sees things that aren’t really there. Or maybe she has the sixth sense! “Hey Dad! Hey Dad! Hey Dad! Hey Dad! Hey Dad! Hey Dad! Hey Dad! Hey Dad!” – I get it Raven there’s something at the door. Our solutions is to redirect Raven’s behavior by using the cue “Go To Your Bed” instead of enduring the continual barking. So, I heard that some people don’t like dogs…WHAT!? And said people really don’t like dogs jumping up, kissing, and hugging when they walk through the front door…WHAT!? I have a solution. We’re going to give Raven the cue “Go To Your Bed” when guests come over so she can settle on her Carlson Portable Dog Cot while guests (especially the non-dog loving type) can come through the front door without getting doggy love. Finally, for the past year and a half we have a new player in the household: Miss Emma. One of Emma’s favorite activities is throwing her food on the floor. I don’t like letting Raven eat food off the ground without permission because you never know if she’s going to accidentally pick up something toxic like raisins, grapes, onions, garlic or one of the many other foods that are safe for humans, but not for dogs. Did you know: Interestingly enough, Emma did throw grapes on the floor and lucky for us the dogs didn’t eat them. Which reminds me: Another good cue to have in your repertoire is “Leave It”. We’re going to give Raven the “Go To Your Bed” cue while Emma eats her meals and have Raven stay at her bed until we have time to clean the floors of any toxic foods. Teaching your dog “Go To Your Bed” is not as difficult as it might sound. Today, we’re using the clicker to train Raven. If you don’t know your clicker training basics then you might want to brush up by reading a good clicker training book like PUPPY Start Right. Treats – Happy Howie’s are awesome treats for training. Just cut them up into tiny training sized bites. Clicker – We prefer these clickers with the little wrist band over the box clickers. 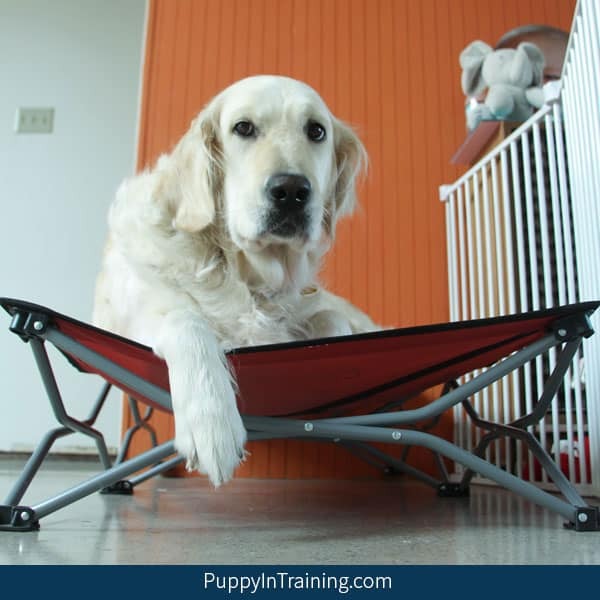 Dog Bed -We like the elevated Carlson Portable Dog Cot for teaching this behavior. That’s it! Of course if you’re really fancy you can add a treat pouch to that list. Before we get started find an area with minimal distraction. We use our backyard. Put out your dog bed, fill your treat pouch, and have your clicker around your wrist. Click/Treat any interaction with the dog bed: sniffing, stepping on, jumping on, pawing, etc. Toss or place treats directly on the bed. Release your dog by saying “OK” and tossing a treat away from the bed. Repeat from Step 1. As your dog progresses only Click/Treat the best behaviors. For instance, instead of C/T the sniff try waiting for pawing the bed, jumping up on the bed, two paws on the bed instead of just one, etc. The first time your dog goes on the bed and lies down give a jackpot (multiple treats) and lots of praise. Once your dog is consistently (3-5 consecutive times) going on the bed and lying down name the cue “Go To Your Bed”. That’s it! That’s what we did to teach Raven “Go To Your Bed”. Here’s our video with me and Raven showing how to teach your dog “go to your bed”. I was very impressed with how quickly Raven learned “Go To Your Bed”. In the video the unboxing was the first time I introduced Raven, Charlie, and Linus to the Carlson Portable Dog Cot. I let them play around on it then I took a few pictures using a lure to get the dogs onto the bed. Then I put it away for a couple months until I was ready to teach Raven “Go To Your Bed”. Around the 1:38 point of the video is when I re-introduced Raven to the bed. It was her first training session with the bed and while there was some editing we only had to work with her for a few minutes before she was going to the bed automatically and lying down. After she did 3 consecutive downs on her bed we named the cue and the rest is history. Full Disclosure: Raven already knew the very similar behavior “Go To Your Mat” and she quickly picked up how to go to her bed. My expectation was she might understand what was asked, but I wasn’t so sure she’d be comfortable jumping up onto the elevated dog bed. I was planning on taking 3 days with multiple training sessions per day to teach her this cue. As you saw in the video she had it on cue in under 5 minutes. When we taught Raven “Go To Your Mat” it took her much longer to learn. We spent a week teaching the behavior before we introduced the cue. As I mentioned in the video we’ll try again when we have our next service dog puppy in training and hopefully shoot some more video to document the training sessions. I imagine it’ll take multiple sessions before we can introduce the cue. That’s it! That’s the basics on how to teach your dog “Go To Your Bed”. Do you have any tips on how to teach this cue? Are you trying to teach your dog “Go To Your Bed” without success? 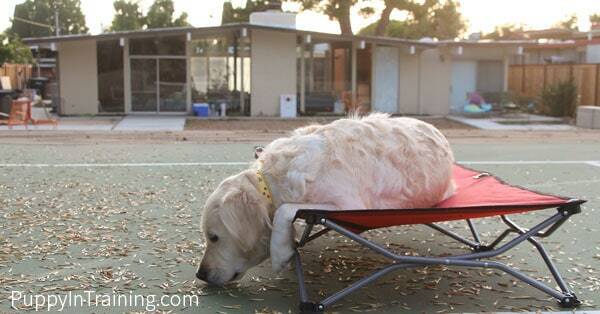 Do you have a Carlson Portable Dog Cot? If you have any questions (or answers) please leave us a note in the comment section below. Thanks! She should be the model 🙂 Raven doesn’t bark when we redirect her to the bed. Right now I’m working on transferring the cue so that when she here’s the doorbell she immediately goes to her bed rather than me telling her “Go To Your Bed”. I’ll let you know how it goes. Wow, I hope the ‘go to your bed’ command indeed alleviates barking at the doorbell. That would be great, especially for someone with multiple dogs. And I’m sure Raven prefers the cot over a mat. The cot seems more comfortable especially if you’re somewhere like a campground etc.. I like that it is easy to fold and store as well. Nice job, Raven! Yeah, I think the dog cot is more comfortable then the mat. One thing I noticed is how easy she found the Carlson bed to target once she figured out what I wanted her to do. I’m wondering if using “Go To Your Bed” will help her be more accurate with her targeting when I ask her to “Go To Your Mat”. Hi colby! i just came across your site and I’m enjoying your articles. So much to comb through and learn from!! I wanted to ask, if i wanted to raise a puppy the way one would a service dog/ guide dog, what’s the best reference tool for me to achieve that? The puppy will just be family pet so i wouldn’t qualify for having service dog in training. Do any of these volunteers and training facilities have manuals a normal person (not service dog puppy raiser) could use as a guide to teach commands? I can’t seem to find any available to the public which makes me wonder why it wouldn’t be? I would love to raise my pet puppy to be as well mannered and obedient as a service dog. Hi Bianca, thank you! I’m glad you’re enjoying the articles. As far as I know the service dog organizations only supply the manuals to the puppy raisers. It’s funny you brought this up though because my plan is to put together a series of blog posts that will detail how we will raise and train our next service dog puppy. The information will be based on my experiences raising puppies for several different service dog organizations. Then at the beginning of next year I will raise another service dog puppy and I plan on sharing his/her journey to become a service dog. If you have any specific questions or if there’s information you’re interested in please feel free to leave me a comment or shoot me an email.